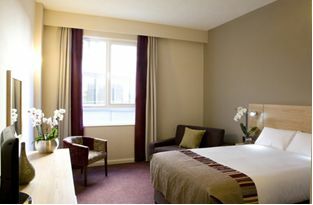 Spacious and comfortable rooms are all en-suite and can accommodate three adults, two adults and two children, or just one person in complete comfort. All rooms are equipped with individual adjustable air conditioning, wired high speed internet access, safe, mini fridge, tea & coffee facilities and flat screen multi channel TV. Laundry/dry-cleaning, 24 hour reception and security, contemporary restaurant, stylish lounge bar and coffee bar, wireless LAN in public areas, secured underground car park (40 places) and air conditioning. 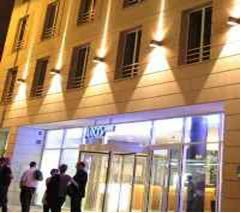 Jurys Inn Prague is a brand new modern hotel located at the heart of Prague city centre, close to Wenceslas Square and just a short stroll to the Old Town and Charles Bridge. The Florence underground metro station is located opposite the hotel and all the city attractions are within easy reach. From metro station Florenc situated 1 minute walk away from the hotel take a metro (line C) and go 4 stops the metro station Vyšehrad. Prague Congress Centre is located next to the metro station. The journey should take up to 10 minutes.